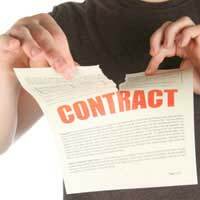 Breach of contract basically means that one or more of the terms and conditions laid out in a contract has been broken. Breaching a contract may lead to the contract breaking down completely and can easily lead to legal action and claims for damages in a law court. When any contract is made an agreement is formed between parties to carry out a service and payment for that service. If one of the parties fails to carry out their side of the agreement then the party can be said to be in breach of contract. Breach of contract can also occur if work carried out is defective or if one party makes the other aware that they will not be carrying out the agreed work. A material breach can be a breach that has serious consequences on the outcome of the contract. A fundamental breach would be one so serious that the contract has to be terminated. An anticipatory breach is one where one of the parties makes it known that they will not be carrying out agreed work, and the consequences can be termination of the contract and damages being sought in court. Damages can be awarded to an innocent party if a law court upholds that a contract has been breached. Damages will be used to compensate the innocent party for their loss due to the breach. These damages are usually a remuneration that will reflect the loss. For example, if an employer dismissed an employee unfairly then the employee could claim damages for loss of earnings under breach of contract. Damages can be awarded even if there has been no actual loss, the innocent party will then usually be awarded nominal damages. If a dispute does occur due to breach of contract then the judge will need to decide that a legally binding contract does exist and that it has been breached. In some cases the contract may only be a verbal contract and there may be no actual written evidence that a contract was formed. In such cases a judge will need to go over the terms and conditions of the contract and clarify what actually took place in practice. Entitlement to damages may be awarded if the innocent party can prove that a breach of contract took place. The innocent party must prove that there was a loss due to the breach and that the nature of the loss would lead to compensation. Remoteness of loss will also be taken into consideration by the courts and may include future loss that could reasonably occur from the contract being broken. Other losses can include loss of profits, the cost of rectifying the breach and wasted expenditure. If disputes do end up in the law courts then the amount awarded may come down to how much documented proof the claimant has regarding financial loss. This can include actual records and document proof of financial loss due to the breach. However, if there is little proof, damages can still be awarded, this will be down to the judge ascertaining all of the facts of the case and not relying solely on documented proof. Breaching a contract can be a serious offence and is a very common reason for lawsuits. Anyone considering court action due to breach of contract should seek expert legal advice before proceeding. Court disputes are a lengthy and costly procedure and the legal costs should be weighed up against the likely damages awarded. We removed our child from a gymnastics class due to my child being bullied by the coach and owner of the club.She (the coach) is now demanding a "terms" money (over £300) in compensation for taking her out before the next season starts.Can she do this under the circumstances? Hello, when my husband received his wages yesterday, he was short pay and he checked with the payroll and ' they said the court brought a letter and asked for £185 plus to be paid to them from his wages and they paid the above amount without informing or seek the consent of my husband. Please is that not breach of contact? my husband was so upset and the employer are saying that he should not be. Please advice. Thank you for your time. @DGSH - you would have to apply to court, unfortunately. A pony went on loan in Aug 17. The loaner was offered to purchase the pony towards the end of the loan in July 18. However, the loaner is refusing return the pony citing various inaccurate reasons. What do we need to do? @Maripon - unfortunately, yes, it is tough luck for you. There is little you can do about this. @pat - as long as they give you the deposit back, there's not much you can do. @Veljibhai - do you have to pay for the terminal? You'd have to ring them and ask for their complaints procedure first and put in a complaint. This will allow them to try to resolve the issue. I bought a horse with a 14 day warranty the horse was not suitable for my needs , I contacted seller and was told they didn't have the money but would exchange it or resell it on my behalf . I was not told this I expected my money back . @None - if you gave the home-owner a price to do the job, then you have to honour that price, even if it puts you out of pocket. If you cannot claim the money back from the person who hired the caravan to you, then you can take it to the small claims court. If the owner employed the cleaner - it is up to the owner to ensure the cleaner has done a proper job and the caravan is fit for purpose. It is not your responsibility. Therefore, you should be eligible for a refund. If the paperwork showed there were three payments due, then the school is under no obligation to remind you verbally also. Your only recourse is to complain directly to the school about the three-hour demand. Bought a static caravan on a holiday park.sales agreement and all other paperwork says we purchased a 2010 van. We have now found out it's only a 2009.also the size is incorect and also the chassis number is incorrect . Is there a breach on this situation? Breach of Condition or Warranty? An advertisement from Furniture store shown that there was a 50% discount on thier three seater sofa and will receive a gift which is two-seater sofa. The advertisement did mention subject to availability. Belle brought the advertisement to the shop and asked for the sofa. She need to ask the permission from her husband so she decided to pay RM200 deposit to the staff and the staff accepted the money and promised to hold the sofa for two days. B be notified that the company only have limited two-seater sofa before she paying the deposit. Two days later, she went back to the furniture store but she noticed that the staff forgot to keep the sofa for her and it was out of stock now. The staff argued that the sofa is just a free gift and it is'Subject to availability'. Hi, I ordered Pizza from Pizza Hut Online for collection and the confirmation said it should take 30mins. I got a text message confirming my order was being prepared so I made my way to the high street as I had a few shops that I needed to go to. After 45mins I still had not heard anything from Pizza Hut saying my order was ready so I walked to the store to find it was shut! By this point I was really hungry and upset, I called the customer services line and asked them what has happened and they said 'unfortunately, through no fault of their own, they have had to close due to a fault with the extractors', there was no apology and I was disgusted that I was not informed. Terms: "If we cannot accept your order. If we are unable to accept your order, we will inform you of this and will not charge you for the product. This might be because of, amongst other things, unexpected limits on our resources which we could not reasonably plan for, because we have identified an error in the price or description of the Product, due to particular Product not being available or if your local Hut is closed at the time of your order" He then asked me if I wanted a refund (silly question), then he said the refund should take 16 working days to come back to me. I thought Consumer Act stated 14 days and on Pizza Hut terms and conditions it says 14, so they have got it so wrong. Terms: "How we will refund you. We will refund the price you paid for the Products by the method you used for payment. We will make any refunds due to you upon collection of the Products from your local Hut, or if this is not possible for whatever reason, please contact us via our online form and we shall process your refund as soon as is reasonably possible and in any event within 14 days" Considering the first term said that they would not take money, I am finding myself waiting now for nearly 14 days. If they take longer then 14 days to give me my money back is there something I can do? I am so angry at this whole experience! I am waiting the results of a home survey which at the time of making payment I was told would take 7 working days maximum, Its now day 8 and I've received nothing, no verbal communication or updates as was agreed at the time of payment and getting no joy from numerous phone calls which aren't being returned. I am entitled to e refund? @Justin - she will not be successful if there was a notice on the door saying the offer had been withdrawn. On June 1st, TST Supermarkets advertise the opening of their new Badili branch in the local newspaper, as follows: Grand opening - 8 a.m. July 1st cash reward to our first customer. Serah arrives outside the main entrance to the store at 6 a.m. on July 1st and is the first in the queue. She sees a notice on the entrance door, which states; The management regrets that the office of K100 cash to the first customer has been withdrawn, but will be replaced by a K100 voucher to spend in the store today. When Sarah enters the store at 8 a.m. she asks for her K100 cash, but the manager says she can only have the K100 voucher. Serah is very angry, and leave the store without buying anything. Serah claims she entitled to K100 cash, but TST Supermarkets contend there is no obligation to pay her. Will Serah claim for K100 successful? @Paula - you certainly need to get them back to put this right that's for sure! Hi there? I bought a 2-bedroom leasehold property two year ago. The terms of the lease say the freeholder is responsible for external repairs and so on. I regularly pay my management and ground rent and owe nothing. Last year, I was told there were leaks into my flat and had caused rot and mold growth in many areas. This was after I just renovated the flat, hence my paintwork, etc were all a waste. I approached the freeholder to fix the leaks as they were coming from the roof, etc and only to be told they would not be doing it as mine is not the first one. They said they were looking at a meeting first of all leaseholders to know what they would and I should carry on paying my management fee. I told them no as now because of the leaks and mold, I have no tenant and the property is being under priced. We have had a similar meeting two years ago on how the freeholder would fix historical neglect with a programme involving a contribution from leaseholders and only to be watered down. I do not believe in theri meeting and so what can I do?